Chris Bouchard has been photographing storms for as long as he can remember. “I got serious at it when I got old enough to drive and could go to where the best weather was happening,” he says. 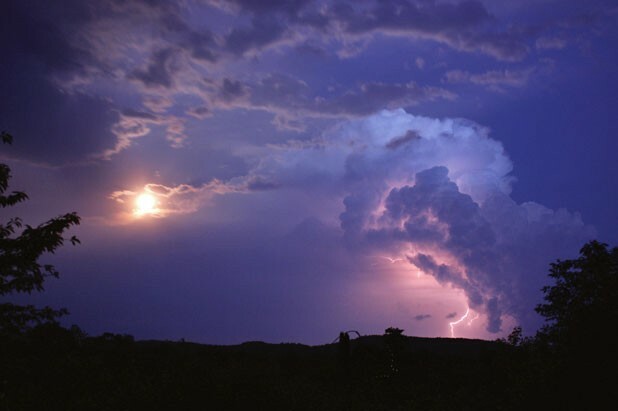 There weren’t a lot of thunderstorms where he grew up near Portland, Maine, but enough to hook him on the dramatic displays. That fascination led him to the meteorology program at Lyndon State College. And now Bouchard, who turns 31 next week, is in his sixth year as a staff meteorologist at the Fairbanks Museum & Planetarium in St. Johnsbury. As such, he’s one of the “Eye on the Sky” guys heard numerous times daily on Vermont Public Radio. Though forecasting and various educational programs at the museum keep him busy, Bouchard hasn’t stopped chasing storms and taking pictures. In fact, the Fairbanks Museum is currently devoting space to his exhibit, titled “Fire in the Sky,” of 32 photographs of lightning. They were taken over the past few years and in several states, but the majority of the 16-by-20-inch images are from the Northeast — within chasing distance of Bouchard’s home in Lyndonville. In a statement for the exhibit, he explains that the lightning strikes shown here were shot from as far away as 15 miles and as close as an eighth of a mile. Matted on foamcore but not covered with glass, the photos offer unfettered proxy views of what Bouchard captured in person: great, sky-splitting bolts — sometimes doubled or tripled — that strike the ground or lash out in spider veins. Often, they bathe the earth below in eerie illumination. From a gallery’s remove, of course, the terrifying prospect of lightning, and thunder’s crashing sound effects, is absent. Nor do you have to get drenched to look at them. All that is left is the beauty. And these pictures are indeed beautiful. In one thunderstorm shot near a farm in Orford, N.H., in 2007, what looks like a fire in the woods throws warm light against a red barn as angry clouds roil overhead. In another, at Lake Willoughby in 2008, the spooky combination of lightning and fog enshrouds the lake in purple mist; a small boat and diving dock are spectral shapes, dimly outlined in orange. On May 26 of this year, Bouchard shot “a close bolt that takes out a tree in Monroe, N.H.” That was part of the storm that caused “all that flooding last spring,” he explains; it produced continuous lightning for about eight hours. Bouchard’s pictures from the Southwest are stark, the lightning creating abstract patterns against an endless, inky sky. Even with digital, Bouchard says, there are basically two ways to capture lightning: You set up your camera on a tripod, open the shutter and “wait for lightning to show itself”; or “you see it and try to click it, and every once in a while it works.” Now, of course, he can simply delete the shots that didn’t.